We couldn’t be any more happier with the ceremony that Eva provided us for our ceremony. Eva went above and beyond with every details. Eva was very professional and made the ceremony very personable. Throughout the whole process leading up the ceremony she took care of everything and provided our moment something that we will remember for the rest of lives. 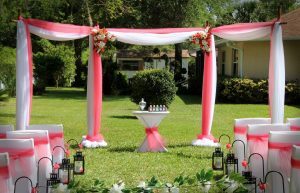 I give Eva the highest recommendations especially for the men out there trying to surprise their wives with a ceremony. Eva will think and take care of every detail. Wow…Eva did an amazing job with our wedding it was exactly as we pictured personal and intimate.! Everything we asked was provided..most definitely would recommend Eva and Affordable Beach Weddings to anyone! Thank you so much Eva for making Marvin and I the wedding of our dreams! Eva did our wedding for us last week. 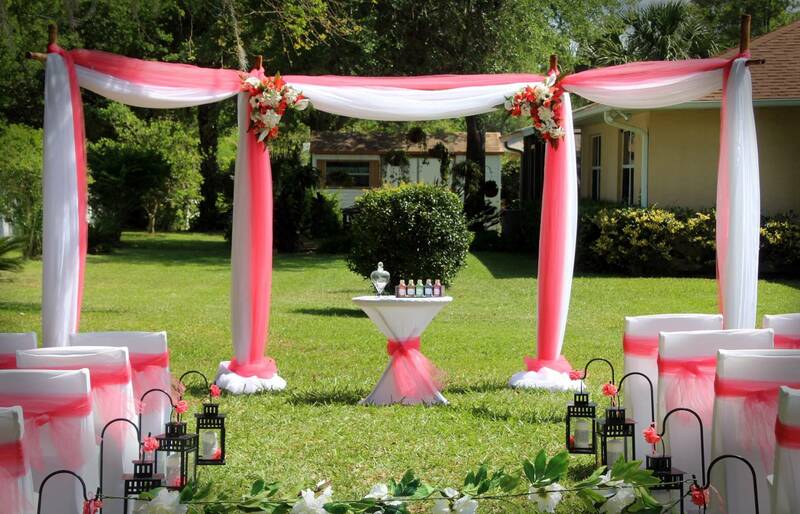 My new wife was just thrilled with her handling of the ceremony, the flowers, the beautiful wedding arch and canopy. She was very professional and helped us with everything we needed. 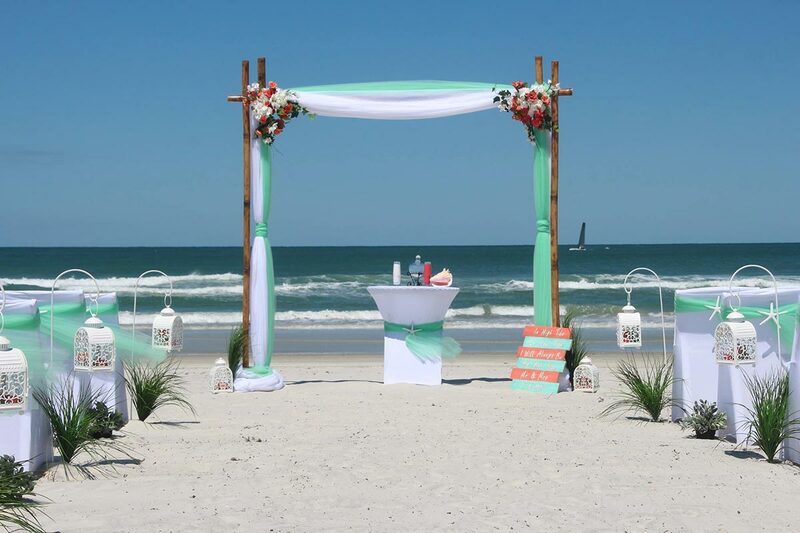 If we have hosted a beach wedding for you please let us know about your experience with us. Thank you! My husband and I got married on 8/24/12, and are coming up on our 1 year anniversary! Mike and Eva did an amazing job when it came to our wedding! Everything was perfect and smooth. They made anything and everything so simple to do. We didn’t really have to do anything at all. Our wedding was more than I had could have ever asked for. Perfection in my eyes. I love the photos that were taken and how it was more than I had ever expected my wedding day to be. I would recommend to anyone I know! You guys are awesome and thank you again! Very best wedding is what my guest said to describe their experience. I enjoyed everything about my big day. The flowers were beautiful and my vision really came to life. Thank you for the work and time you guys put in to make my dream beach wedding come true. Thank you Affordable beach wedding LLC for making our Wedding day so special we appreciate all you’ve done special shout out to Eva and Tanya and the rest of the crew for absolutely making it Beautiful.. Thank you so much Eva, you have made our wedding so beautiful we could not ask for anything better. We loved everything and it was all worth it. I will recommend Affordable Beach wedding LLC to anyone. They are Amazing! Our sunrise wedding on 6-01-13 was more than we could have ever asked for. Thank you Mike and Eva for a very special day for us. You will forever be a part of our lives. WE HIGHLY RECOMMEND THEM TO ANYONE WANTING ANY TYPE OF BEACH WEDDING! My wife, Kathleen, and I can’t say enough how outstanding our wedding was on the beach near the boardwalk in New Smyrna Beach, Florida. The set up by Affordable Beach Wedding for the event was spectacular, and we were lucky enough to have a photo of us land on their website! But even more amazing was the accommodating nature of Eva to make our day “just right.” They presented us with a wonderful ceremony with beautiful flowers and backdrop of the ocean and Ponce Inlet. They allowed us to use our own music, took great photos of the ceremony before, during and after. They also videoed the ceremony which has allowed us to relive the day. We can’t say enough how thoughtful the two of them were in planning the day. We would both highly recommend anyone to use their services to experience a day to remember. Ocean breeze, sand, flowers, beautiful music, and family made the day very special for us. We have to thank Eva for a job WELL DONE! Thank you so much Eva. With your help our beach wedding was everything my husband and I dreamed of. 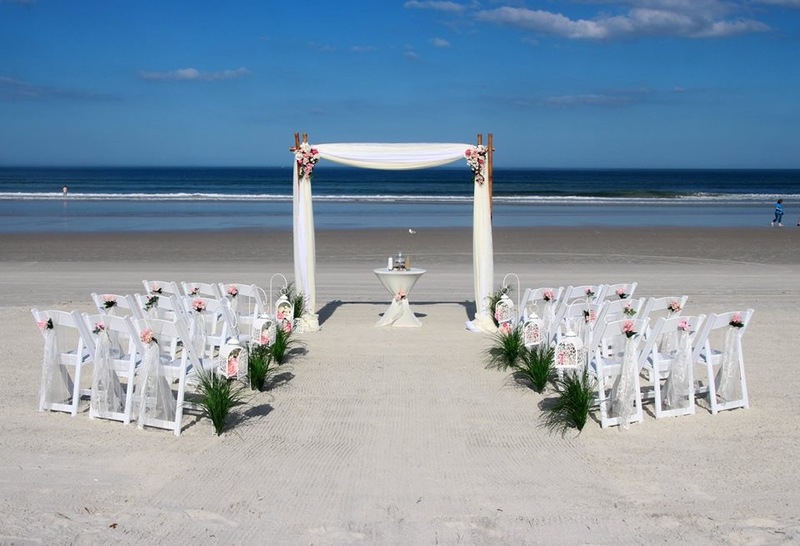 I highly recommend Affordable Beach Wedding LLC to anyone who dreams of a simple yet elegant wedding on the beach. Thanks again you guys. You did so well. We are so happy to have found you, and we wish you the best of luck. Wedding was well planned. We could not be happier. It was fun and elegant. We were expecting everything to be just perfect, and it was! Eva worked very closely with us and planned out everything we wanted for our wedding. She even gave us extra services that we didn’t pay for. All of our photos are on CD for us and they gave us a free DVD slideshow of our wedding. It was just beautiful and I would highly recommend this company to any bride looking for a wedding in Florida. Hi, I’m Sarah, Eva did our wedding ceremony on January 29th. The date was a last minute decision so we didn’t have much time to plan everything when we called about getting married. She took care of everything for us and were really nice people to work with. The ceremony was beautiful and the weather was perfect for a beach wedding. She even gave us a free sand ceremony and it will be something I will always remember. It was beautiful! Eva did a wonderful job with our wedding. It was a very cold day for Florida, but it all went without a hitch and was perfect for us and our guests. She provided us with everything that we wanted and the flowers on the wedding arch and bouquet were more beautiful than we could have imagined. We recommend her to anyone that wants to get married. We got married yesterday on the beach in New Smyrna Beach and it was beautiful! Affordable Beach Wedding had everything we wanted plus a whole lot more. She threw in a lot of extras for our wedding. It was so cold that day on the beach but it was all worth it. The ceremony was perfect, the flowers were beautiful and the photos were stunning. We are going on our honeymoon today, but we wanted to say “Thank you” for making our wedding day so perfect.